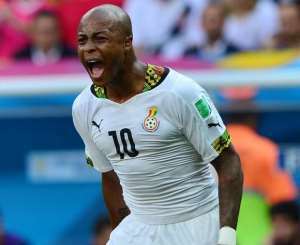 Deputy Captain for the Black Stars, Andre Dede Ayew has stressed that 24 countries competing at this year’s Africa Cup of Nations (AFCON) make it even more difficult to win the trophy. A CAF Executive Committee, following a two-day football symposium held in Morocco’s capital Rabat last year, adopted a resolution to expand the AFCON from 16 to 24 teams, with the new format set to be effected during the 2019 edition. After winning Group F to book a spot in the prestigious competition, the stakes are even higher than ever with the West African country determined to win Gold for the first time in over 3 decades. Speaking in a post-match interview following a 3-1 win over Mauritania on Tuesday, 26th March 2019, Andre Ayew indicated that after representing Ghana at 5 different AFCON tournament, he is convinced this year’s edition is going to be much tougher.